Self striping yarn shawl patterns are simple to make and so beautiful. The self striping yarn does all the work for you and you can create very colorful, eye-catching crochet projects without having to change colors.This is the case with the Amazing Grace Angel Wing Shawl free crochet pattern designed by Elena Hunt as well. Made using the Amazing Grace stitch pattern, this crochet shawl is an elegant and flowing accessory and its message is beautiful. 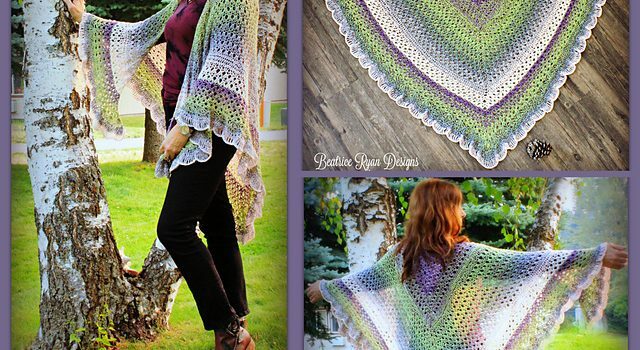 Check out the original source for this Amazing Grace Angel Wing Shawl Free Crochet Pattern with all the directions and full written pattern at: Beatrice Ryan Designs: The Love of Crochet. Thanks to Elena Hunt for the article inspiration and featured image.